The Spring Festival stalls continue to write good results. The media sector is looking forward to "Spring"
Eight domestically produced blockbusters compete on the same stage. This year's movie Spring Festival file has become one of the crowded and lively Spring Festival seasons in recent years. On the New Year's Day, the box office score of more than 1.4 billion yuan was the highest single-day box office in the history of film. The Spring Festival movie box office has once again achieved good results, and the media sector will usher in new opportunities. Analysts said that there was a significant sign of strength in the A-share market media sector before the Spring Festival holiday. During the Spring Festival period, the industry as a whole also performed, and in the early stage of negative digestion, the sector is expected to strengthen the background, the market media sector is expected to usher in the market again. In the 2019 Spring Festival, the box office of the movie has once again achieved a good start, which is in line with the expectations of the sector on the last trading day before the Spring Festival. On the last trading day before the holiday, the two cities opened higher and higher, and the sector also showed a positive trend of full-line growth. As of the close of the day, CITIC Media rose 3.01%, ranking the forefront of various industry sectors. However, in 2018, the total box office of the film hit a record high, and the domestic film counterattacks the harvest box office and the word-of-mouth harvest. However, the stocks of the film and television industry saw a significant decline last year. The performance of related companies declined, and the number of films in the industry also showed a downward trend. Wind data shows that Shenwan Media's sector fell by 39.58% in 2018, underperforming the Shanghai and Shenzhen 300 during the same period. 66 constituent stocks in the cultural media sector onlyVisual ChinaandPhoenix MediaThe two stocks rose positively. According to the data released by the National Film Bureau, the total box office (including service fee) of the national film in 2018 was 60.976 billion yuan, a year-on-year increase of 9.06%. Among them, the domestic movie box office was 37.879 billion yuan, accounting for 62.15% of the total box office, an increase of 8.31% compared with 2017; the box office exceeded 82 million yuan of film, including 44 domestic films; the country added 9597 new screens, the total number of screens has reached 60079 Zhang, a year-on-year increase of about 18.3%, the screen construction still maintains a high growth rate. For the market outlook,Haitong Securities(Hong Kong stocks 06837) are optimistic about the steady growth of the box office market in February. The agency said that in recent years, the box office of the Spring Festival has continued to rise, and the net box office of the Spring Festival in 2018 was 5.461 billion yuan, a year-on-year increase of 68.7%. In view of the fact that the 2019 Spring Festival stalls are blessed by many types of large-scale blockbusters, the short-term Spring Festival catalyzed, followed by a number of imported films continued to be fixed, continue to be optimistic about the steady growth of the box office market, investors can focus on quality content development and key channel companies. Huatai SecuritiesIt has been said that in 2018, the audience has accelerated its maturity, and the word-of-mouth has become more and more important. The type continues to expand, and the realism theme can also obtain high box office; the quality of domestic films continues to improve; the concentration of cinemas has increased; The competitive focus of the online ticketing platform is expected to shift from ticketing investment to refined services in the upstream and downstream of the industrial chain, creating incremental value for the industry. There is still a certain gap between China's film industry and the world's advanced level, but it also means development space. With the improvement of the industry status, the industry outlook is expected to recover steadily. According to the cat's eye movie data, as of 22:00 on February 9, the total box office of the Spring Festival in 2019 exceeded 5 billion yuan. "Wandering Earth" ranked first with 1.58 billion yuan, "Crazy Alien" ranked second with 1.29 billion yuan, and "Flying Life" was ranked third. On February 5th, the national movie box office was fixed at 1.439 billion yuan, breaking the single-day box office record of 1.28 billion yuan last year, up 13% year-on-year. Looking back at the history of the plate, the trend of the Spring Festival movie and the media sector is relatively relevant. 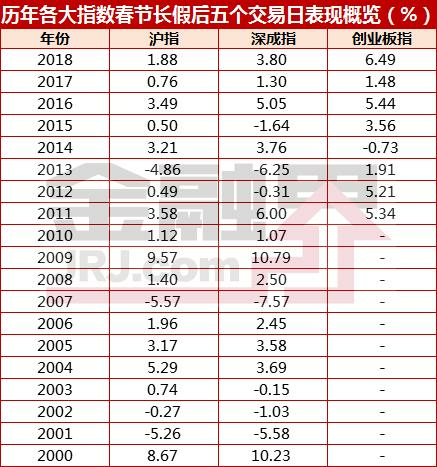 From the performance of the 5th day before and after the Spring Festival, from 2000 to 2018, there were 15 times on the 5th day before the Spring Festival, accounting for nearly 80%; on the 5th day after the Spring Festival, 14 times were up, accounting for over 70%. Among them, the media sector rose on the 5th day of the festival from 2013 to 2017, and rose from 5th to 6th after 2016 to 2018. "Red Sea Action" into the Spring Festival box office champion, the final box office is expected to surpass the "mermaid"
Shen Wanhongyuan: The box office of the Spring Festival has increased by 70.7% year-on-year. The total number of box office in the Spring Festival is nearly 5.8 billion. Wang Baoqiang may be compensated for the loss of the price.